The Family Cafe is proud to announce the publication of the 2012 edition of The Family Cafe Questions & Answers Book. This publication is a direct product of the engagement shown by all of our attendees at The 14th Annual Family Cafe this past June. We collected dozens of "pink cards" from people with disabilities and their families, and shared their questions and comments with the State Agencies that exist to serve them. This year's Q&A Book includes information from the Agency for Healthcare Administration, the Agency for Persons with Disabilities, the Department of Children and Families, Department of Education, Department of Health, Division of Emergency Management, and the Division of Vocational Rehabilitation. We have also responded to the may questions that were directed to The Family Cafe itself. You can find our 2012 "Report Card," with ratings and feedback from our attendees about The 14th Annual Family Cafe, too. You can find The Family Cafe Questions & Answers Book for 2012 here! We are pleased to announce that The 15th Annual Family Cafe Program for is now available here on our website! To view the entire program for The 15th Annual Family Cafe, simply follow this link. It will take you to a pdf version of the event program, complete with descriptions of all of the presentations, as well as details regarding the keynotes, special events and live demonstrations that will be included at The 15th Annual Family Cafe this June 7-9. There will be a lot going on at The 15th Annual Family Cafe, including dozens of great sessions, interesting keynotes and a great Annual Summit on Disabilities with three special guests. It's never too early to start planning how you will spend your time at The Annual Family Cafe. So why not check out the program and get started today! We are pleased to announce that pictures from The 15th Annual Family Cafe are now posted in our photo gallery! To view the pictures, visit http://www.familycafe.net/gallery/index.php/The-15th-Annual-Family-Cafe. We hope you enjoy browsing our gallery, and checking out everything we had going on at The 15th Annual Family Cafe! If you were there, you just might find a picture of yourself in there! And if you couldn't make it, hopefully these pictures will help motivate you to join us in 2014! The Family Cafe is pleased to announce that the full program for The 16th Annual Family Cafe is now available for your viewing. To see the full program, follow this link. The program includes details of every session at the event, including a full synopsis of every presentation. 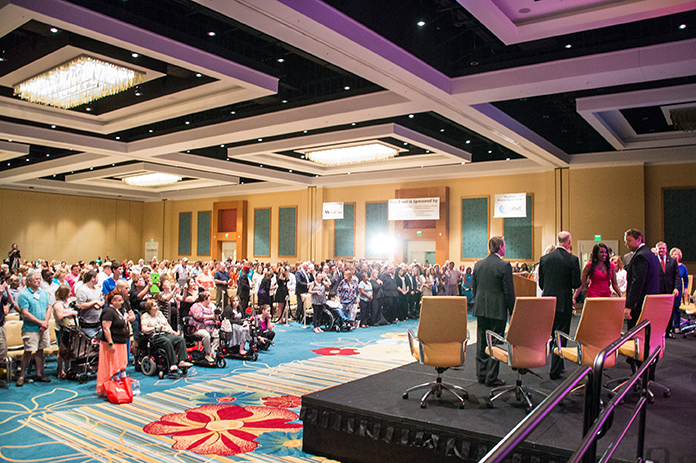 There are also details about the keynotes and special events we have planned, including The 16th Annual Governor's Summit on Disabilities on Saturday morning, and an appearance by NFL legend and disability advocate Dan Marino on Friday night. There will be a lot going on at The 16th Annual Family Cafe, with dozens of activities and educational opportunities to choose from. So why not check out the program, and get a head start on planning your visit to The 16th Annual Family Cafe! The Family Cafe is pleased to let you know that photos from The 16th Annual Family Cafe are now available here on our website. We have a gallery of 600 images posted here. To see the complete set of photos, just click on the "Read More" link at the bottom of the article. We had a wonderful time hosting The 16th Annual Family Cafe, and the pictures here definitely capture that! We hope you enjoy browsing through them! Join Family Cafe Mailing List and receive latest news and updates.